The association between audit reports and bankruptcies: further evidence (D.V. Rama et al.). Retention of women in public accounting: directions for future research (K.L. Hooks et al.). Effects of engagement–wide inherent risk factors on auditors' evaluations of multiple explanations from client and audit team sources (S. Ayers, S.E. Kaplan). An investigation of the relevance of disclosure of asset composition in assessing distress risk of savings institutions (S.J. Roohani, Z. Rezaee). Evidence of the relations between firm characteristics and reserve revisions in the petroleum industry (F.L. Ayres et al.). 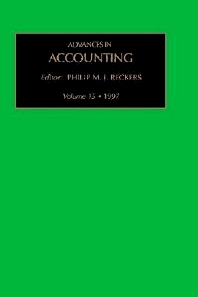 Accounting accruals and the incremental information content of earnings and cash flows from operations (C.S. Agnes Cheng et al.). An investigation of the impact of market discipline on individuals' price revisions (C.E. Davis et al.). The impact of earnings management of bank risk premia (T.R. Robinson, J. Grant). The comparison of dysfunctional behaviors by tax accountants and auditors under time budget pressure (T. Dalton, T. Kelley). A comparison of AHP and ANOVA decision modeling techniques in internal control procedure evaluations (S.A. Webber, J.M. Hassell). A longitudinal analysis of environmental disclosure practices (S.D. Stanwick, R.H. Tabor). A Bayesian analysis of cost-effectiveness of auditing for small businesses (A.V. Deshmukh et al.). Participative budgeting under uncertainty: multi-period experimental evidence (L. Kyj, P.S. Greenberg).